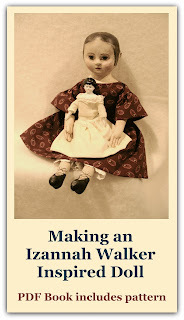 There was some discussion recently in a doll making group about Izannah's patent, so I thought it would be good to post a transcribed and searchable version of the Izannah Walker Patent that can be found at Google Patents. You can view Izannah Walker's original patent here. 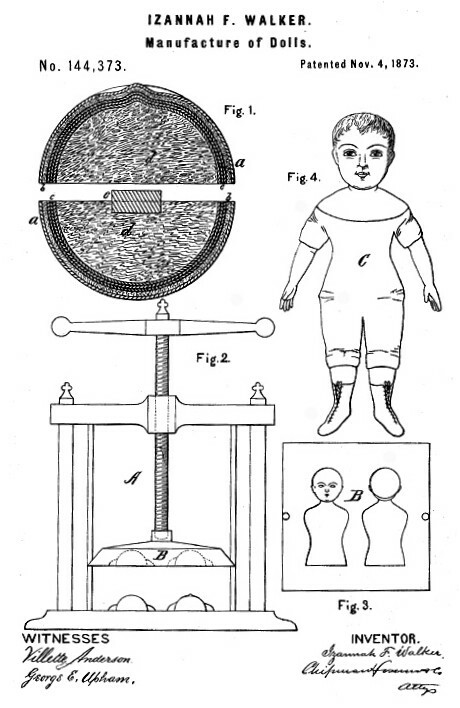 Be it known that I, Izannah F. Walker, of Central Falls, in the county of Providence and State of rhode Island, have invented a new and valuable Improvement in the Manufacture of Dolls: and I do herby declare that the following is a full, clear, and exact description of the construction and operation of the same, reference being had to the annexed drawings making a part of this specification, and to the letters and figures of referenced marked thereon. Figure 1 of the drawings is a representation of a transverse section of my doll. Fig. 2 is a view of my press. Fig 3 is a view of my die: and Fig. 4, a view of my doll completed. This invention has relation to the manufacture of dolls; and it consists, mainly, in the secondary or double stuffing next the external or painted layer, whereby, with a sufficiently soft surface, the tendency of the paint to crack or scale off is obviated. 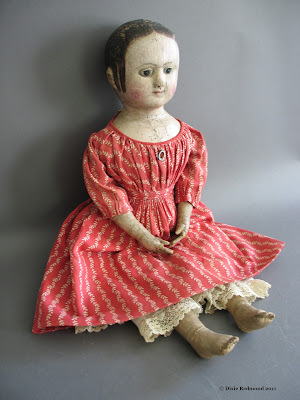 In the construction of my doll I usually employ a press, A, of ordinary construction, provided with upper and lower dies, of suitable shape, to form the front and back of the face, neck and chest, and sometimes the body of the doll. In the dies I place several thickness of cotton or other cheap cloth, treated with glue or paste, so that they will adhere together and hold the shape impressed upon them by the dies. When these cloth forms are dry and a layer of cotton batting or other soft filling is carefully laid over them, covering the whole or the head and neck portions only, as may be desirable, and then, in turn, covered with an external layer of stockinet or similar webbing. The latter is then fastened to the features of the cloth forms by stitches or paste, and they are then placed again in the press. After they are taken from the press the forms are filled with hair, cotton, or other stuffing, and a piece of wood having been centrally and longitudinally laid between the two for stiffening they are tightly pressed together and secured by sewing, pasting or gluing their edges to each other. The finishing is then done by painting the face and other parts neatly with oil-paint. In the drawings, the letter A. designates a form of press which may be used. B represents the upper die-plate with the dies for pressing the sections into form. “a” indicates the outer webbing; b, the outer or secondary layer of stuffing; c, the inner layers of cloth, glued or pasted together, and mainly giving forms to the parts; d, the inner or hard stuffing; and e, the stiffening-rod. C indicates the doll completed, by painting and the attachment of limbs. These parts, if thought desirable, may be made with the advantage in a similar manner to that above set forth for making the head, neck and body. My doll is inexpensive, easily kept clean, and not apt to injure a young child which may fall upon it. It will preserve its appearance for a long time, as the soft secondary stuffing under the stockinet or external webbing enables it to give under pressure, so that the oil paint will not scale off. At the same time the inner an dmore compact stuffing prevents ordinary pressure from forcing the surface in to such an extrent as to crack the paint. In the manufacture of dolls the combination, with the external webbing, the internal cloth forms and the inner packing, of the secondary or outer stuffing between said forms and said webbing, substantially as specified. In testimony that I claim the above I have hereunto subscribed my name in the presence of two witnesses.